Packaging 2 lb block in a mesh application bag, 4/case. 5 lb block in a mesh application bag, 2/case. BCL5000 will degrade a wide range of hydrocarbons including: gasoline, diesel, crude oil, benzene, toluene, ethyl benzene, and xylene. BCL5000 can be diluted 20:1 to make a top notch cleaner for machines, general automotive, and tool rebuilding applications. 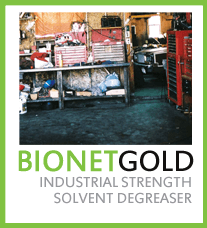 Use full strength for applications where heavy greases are a factor.